QUANTICO, Virginia — The U.S. Army Criminal Investigation Command is seeking first lieutenants and captains, from all military occupational specialties, interested in becoming CID Special Agents to submit applications to transition to a CID Special Agent warrant officer, MOS 311A. MILPER Message Number 18-054, Officer Application Requirements for Appointment to CID Warrant Officer (MOS 311A), outlines the specifics of the program. “Applications will be accepted through May 18, 2018,” said Lisa Dodd, chief of Special Agent Accessions Branch. “Approved applications will be considered by the warrant officer accession board which convenes in July 2018, so qualified applicants are encouraged to visit the closest regular Army CID office to start the process as soon as possible. Please keep in mind that one does not have to have a police background- it’s not a requirement to qualify and be accepted into this specialized program. A complete list of CID offices can be found www.cid.army.mil. In addition to the CID Agent application, qualified officers must also prepare a warrant officer application. The warrant officer application, and the CID application and packet submission checklist are available at your local CID office. The warrant officer application requirements, packet submission checklist, and Warrant Officer Recruiting Team points of contact are located on the U.S. Army Recruiting Command website at www.USAREC.army.mil/hq/warrant. For more information, visit www.gowarrantnow.com or contact the Warrant Officer Recruiting Team at usarmy.knox.usarec.mbx.9sbn-wo-team-questions@mail.mil. As CID Special Agent warrant officers are subject matter experts and leaders who manage all aspects of felony criminal investigations in all operational environments. They plan, organize and supervise criminal investigations, protective services and rule-of-law operations. According to senior CID leadership, the Commissioned Officer to Warrant Officer Program is open to all specialties. It’s a unique model because company grade officers have a great deal of leadership training early in their career versus a great depth of technical training and our warrant officers have an extensive amount of technical proficiency. This blend between the commissioned and warrant officers is viewed as synergistic because those junior agents can share lessons of both leadership and technical work with the newly transitioned officers. This is the third consecutive year this particular recruiting program has been offered. Prior to that, transitions were on a case-by-case basis. 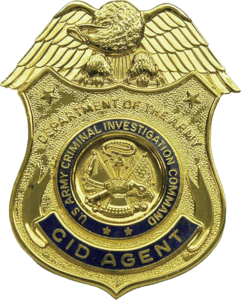 Dodd added that qualified officers who are interested in becoming CID special agents are encouraged to contact the CID Special Agent Accessions Branch for specific details at USArmy.Join-CID@mail.mil. They can also contact the nearest CID office, where personnel can help answer questions about the special agent program. Those selected for appointment will be scheduled to attend the CID Special Agent Course at Fort Leonard Wood, Missouri, and the MOS 311A Warrant Officer Basic Course, also at Fort Leonard Wood. Acceptance into the CID program is contingent upon successful completion of all training and a favorable Single Scope Background Investigation. Appointment to warrant officer will incur a six year active duty service obligation.